It's easy to forget, as Nintendo has seemingly decided that it's no longer a definitive unique selling point, but the 3DS has a fantastic stereoscopic 3D screen. It's tempting to be blase about it, but it's still the only mainstream piece of hardware — certainly in gaming terms — that uses it so effectively. The exceptional level design in Donkey Kong Country Returns on Wii featured dynamic shifts in perspective and depth, so this 3DS port makes a lot of sense, in that respect, and we'll ease any lingering nerves right off the bat — Monster Games has done a terrific job with Retro Games' masterpiece. And it is a masterpiece. If you missed out on the Wii version, you arguably passed on the finest 2D platformer on the system, though it certainly has a lot of competition. While there are enough throwbacks to entertain fans of Rare's Super NES trilogy of titles, Donkey Kong Country Returns 3D nevertheless stamps its own identity on the franchise, with a cartoonish visual style, exceptional performance and weighty physics. This is running and jumping like the old days, but DK has a real sense of weight — appropriate for a large tie-wearing ape — and adjusting to that feel is one of the first challenges and delights that you'll face. Like almost any platformer with a Nintendo brand, your adventure starts off in the hero's home territory, gently introducing you to the mechanics before ramping up the difficulty. 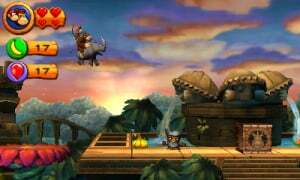 There are eight initial areas/worlds, with between 6-8 levels and a boss encounter, with each progressive area moving around and up DK's island as he battles masked Tikis to retrieve his banana stash. It's not the Citizen Kane of gaming, a title Retro Studios was awarded by some for Metroid Prime, but it's humorous and full of quirky character. In typical Nintendo style this is gaming at its most irreverent and, most importantly, fun. 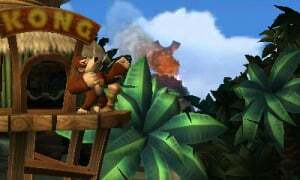 DK wears a tie, Diddy Kong has a jet-pack and clings to his old ape's back — invaluable for extending and controlling the hefty primate's jumps — while also firing a peanut gun in local multiplayer. Diddy is particularly valuable as the difficulty ramps up, not just for his jet pack but the extra hits he allows. In normal mode DK has two hearts, with Diddy adding his own when he's released from a barrel; lose two hearts and you lose Diddy Kong, which encourages a careful rather than reckless approach. You explore worlds that incorporate pirate ships firing cannons, sprawling forests with enormous swinging contraptions, a factory full of smog, a brooding volcano and more. Each has its own variations of enemies, twists on the game's conventions and, at times, devious trickery. The tempo's never settled, keeping you on your toes as you go from a steady level heavy on exploration, to rushed stages riding a rhino over collapsing environments, and then terrifically entertaining mine kart and rocket barrel set pieces. The DK platforming mechanics put to work in these areas are unique from its Nintendo contemporaries, helping this franchise to distinguish itself. Beyond basic moving and jumping, we have rolling — used to make a longer jump or take out enemies — as well as pounding and blowing. All have to be used, particularly when seeking out hidden puzzle pieces — which unlock concept art and other goodies — and the all-important KONG letters. You're not simply blasting through levels and looking for hidden areas — though they're in there too — but also manipulating plants, fans and other parts of the environment with the blow and stomp mechanics. Figuring out which items can be manipulated is a treat for first-timers once the process clicks, with the title sensibly forgoing time limits and allowing you to progress at your own rate. You can also tackle Time Trials, the gold medals of which require perfect runs, while keen players will eventually unlock a minor but challenging additional variation for each level. Those unique mechanics highlight one advantage this version has over the Wii original, as waggle has deservedly bitten the dust. While waggling to pound and blow was passable in the original release, tolerated due to being part of an exceptional title, the 3DS setup is a far more intuitive affair. DK now grabs vines, barrels and grasses with either shoulder button, while pounding and blowing is done with X or Y. With A or B to jump, settling your thumb over the two main buttons while keeping a finger poised over the shoulder button becomes second nature, and most importantly removes any quirks of inadvertently shaking the Wii Remote and plunging to your doom. While we certainly recommend the Circle Pad control scheme outlined above, there is an alternative to use the D-Pad for movement. In this option grabbing is fixed to X, with Y taking over as a Run button, as DK gambols along at a slower rate than he does with the Circle Pad at full stretch — stomping is now moved to the shoulder buttons. It works and apes the Mario run/dash mechanic, and may be good for less experienced players to naturally run at a slower pace, but is less intuitive, while later more demanding levels will likely be too difficult for anyone that can't handle the mascot's lolloping pace on the Circle Pad. For veterans of the Wii title considering a double-dip there's likely to be one key question; what's new? The headline addition, for experienced gamers in any case, is the Cloud Gateway, which features eight brand new levels as well as the tricky finale from the original. Each is based on one of the eight worlds, and represent some of the most challenging moments in the entire game. They're all excellent and welcome stages, with a few that are standouts due to their length and/or witty level design. 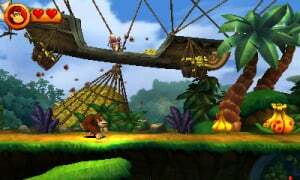 Only unlocked after collecting all KONG letters and completing rather tricky Kong Temples, they reward persistent and skilled players, potentially beyond the scope for some jumping into this title as one of their first platformers. That does bring us to the New mode, introduced to help those that may struggle with the level of difficulty in this game — particularly its sub-objectives of Kong Letters and puzzle pieces. 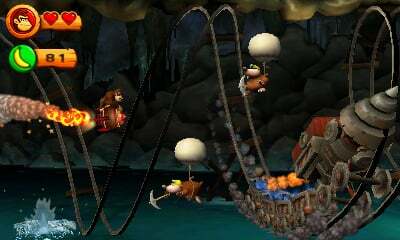 While the levels are the same, the shop in each area not only offers the additional level key, extra lives and energy boosts, but also a DK barrel that you can activate on the touchscreen when in a tight spot, a green balloon that'll save you from a pitfall — though not on a mine kart or rocket level — and a potion that adds two extra hits to the traditional one-hit deaths of the kart and rocket barrel stages. DK and Diddy also have an extra heart each by default, taking you up to six when both are in action, and along with the original items they can potentially be invaluable. One area where this 3DS port falls short of its Wii predecessor, though not in a substantial way, is with its framerate. The Wii title earned plaudits for its attractive visuals and impeccable performance, never dropping a frame and therefore being one of the smoothest platformers to grace any system. This 3DS version retains the visuals and excellent sound design, but can't match that level of smoothness. The framerate performs well, with just the occasional but minor dip, but doesn't have the silky 60 frames of the home console version. That applies in 2D, too, though there are some moments where the animations are marginally smoother with 3D off. It's a trade-off, but for our money the title looks wonderful in 3D and performs admirably; the level designs and aforementioned dynamic camera shifts feel like they were conceived with the 3DS in mind. Those that are intimately acquainted with the original will notice that this is more 30fps than a stunning 60fps, but it quickly becomes relatively unimportant. When you throw in local multiplayer — though both players need a copy — we have a faithful and top-notch port of a Wii classic. While occasionally its home console origins betray it, with a lower framerate, this is nevertheless a treat for 3DS owners. Some may say it's a gimmick, but when you've catapulted into and towards the screen from exploding barrels with the 3D slider all of the way up, it's immediately memorable. Combine that with some extra levels and an easier mode, and we have a fantastic portable iteration of the game, even if the Wii version pips it at the post as the definitive version. Donkey Kong Country Returns 3D may be a port less than three years after its original, but it has a new burst of life on Nintendo's handheld. The 3D effect has arguably never been better used in a platformer on the system — ironic as it wasn't originally designed for the hardware — and it's a technically sound iteration of one of the Wii's very best games. This is platforming at its finest, imaginative, exciting and playful, while also laying on a serious challenge for veterans and skillful players. The New Mode helps less experienced gamers along, though they'll need to learn and improve quickly, and if you're diligent there are eight terrific new stages to discover. It's not as silky smooth as its Wii predecessor, which strips it of perfection, but it does dispense of waggle. If you haven't played this on Wii and want it on the go, this is a must-buy. If you're wondering whether to double-dip, you can be confident that this isn't a half-baked sloppy port, but does the original justice. It's most certainly on like... well, we're not allowed to say that, but you know what we mean. Having not played the original, I am pumped! Gonna get this at a bargain/sale price. Already have the Wii version. Thank You! For those first two sentences. Some people have money to burn so we'll have fun with it again. Nice review as always. Still not interested in buying it tough. I have the game on the Wii, so I will not be buying. But to everyone who hasn't played this nice game yet, no time like the present! I'm double dipping simply because I never finished the wii version. Plus I want this with mme at all times and its the best version. Can't wait to see how this looks on the 3ds! I don't know if I should get the Wii version (never played it) or just forget about it and buy it for the 3DS. What should I do? The lower frame rate is going to REALLY annoy. I know you said it wasn't a huge issue but I'm sure I'm going to notice it, especially since I have played the Wii version. And I had lower framerates. @KodyWB-98 Reason I'm skipping this & RE: Revelations on my 360. I already have them on another system, & too many good games are coming out already. I probably will not end up purchasing this version since I have already 200% completed the Wii version. Though if I hadn't already played it, this would be the version I would get. How are you guys review a unreleased game?... oh is a nintendo game carry on then. I wan't planning on getting this, but know...it might be a bit hard. This kind of makes me wish I had never gotten the Wii version, although I have no regrets as it is a great game all around. Those who are purchasing it should be very excited and happy! I love the 3DS, and it just keeps getting better. For the naysayers: Yes! Ports, remakes and all! Looks great, but I have the Wii version and far too big a backlog for a do-over on the 3DS. I did download the 3DS teaser video and watch it a lot. The game looks amazing in 3D. got to buy this game for two reasons,its in 3d and you can take it on the go. Well, now the people who skipped the Wii version because of the waggle controls (an overblown issue, IMHO) will have no excuse. In that way Nintendo is smart to rerelease it, but I consider the new things too small for a double dip. Won't be getting this for myself. Wii version alone is perfect enough for me so no need to double dip wasted money. I highly recommend this game though for anyone who never played the original and for those who don't have a wii. I might get this... The Wii's controls ruined that for me. This is going to be hot, and the price already got reduced from $39.99 to $34.99! "waggle has deservedly bitten the dust" Would have been enough of a review for me. Still a great review, but that was what I needed to know. Soooo happy. i passed up the wii version, don't remember why. i am so stoked for this on the 3ds! 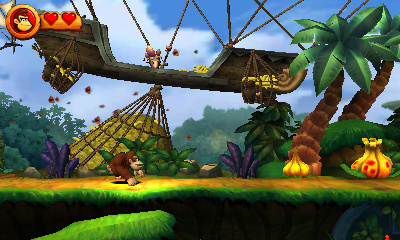 i love donkey kong country games! Can't wait to get this in the mail, I preordered last month. Never played the Wii version so this was a must buy. So because it lacks 60 frames per second, it's not the definitive version in spite of getting rid of the questionable waggle controls, adding new levels and being more accessible to a wider range of players? I'm definitely going to get this version even though I do have the Wii version, as this, to me, is clearly the definitive of the two. Soooo... It's On Like Diddy Kong??? So excited! I didn't play the wii version so I want to see what it's like. The Country trilogy the snes is my favorite trilogy of all time! Did not play this on for reasons I still can not explain. But it looks like my 3ds is going to have more gold coming to it. So... its the Wii version, but sacrifices some of the technical feats for a lack of waggle? I'm okay with this. Never played the original, cause I hate the waggle, so I will give this version a shot. NIce review, helped me make my decision. @Musterd I hope not. My 3DS mic is totally unresponsive. I could deal with the frame rate dips from time to time. I just don't feel the need to purchase this game again for traditional controls since the motion controls worked perfectly (for me at least) and the inclusion of 8 or so new levels. Even so, for anyone who hasn't already picked this game up, you are in for a treat. Easily one of my favorite Donkey Kong games to date! I'm happy to see that the Nintendo 3DS received a great remake of this amazing game. I'm SOOOO EXCITED to play this!!!!! Seriously, the FRAMERATE is the reason why this isn't getting a 10/10, like its Wii predecessor did? The 3D effect, extra levels, accessibility, AND removal of waggle controls aren't enough to compensate for that 30 fps... I get that Corbie Dillard did the review for the Wii version, and different people will have different opinions, so I'm just gonna pretend Corbie did the review and gave it the 10/10 it deserves. "It's not as silky smooth as its Wii predecessor, which strips it of perfection, but it does dispense of waggle." I'm surprised people are moaning it's not got a 10/10 despite having frame rate issues. I had a friend go to the recent media event and he said the frame rate issues were terrible, and by that point it was almost certainly ready to go gold within a week so he couldn't see it being fixed. He actually described it as a mess. @Peach64 Events never have the most recent build. NL is playing the retail version, so I'd trust them. Can't wait for this. Better controls, new levels, and portability are an instant sale to me. @SparkOfSpirit Maybe. It seems weird to organise an event for the media to play your upcoming games so they can go away and write positive stuff about them, but supply them with a poor build. I'll be getting it anyway, my free game in the NOE promotion, I just hope NLife haven't ignored major technical issues. Bring kirbys return to dreamland as well on the 3ds. I might be order this next month. I adore DKC. The difference isn't that noticeable in most games. I can't wait to experience this title, as this will be my first time playing it. I'm buying it again, mainly because the Wii version was too hard, so I shall be welcoming easy mode. 3D, lack of waggle and new levels are just a bonus. Can't wait till the 24th! Didn't get the Wii version, so I'm getting this. I'd take that slightly lower framerate, I'm assuming it doesn't affect the gameplay in any obvious adverse way, if it means we also lose the stupid waggle too, any day of the week. Maybe if I can find it cheap... maybe. On the framerate. I never had issues beyond what I described in the review, and it didn't stop me having a fantastic time. The Wii game was exceptional, ad 60fps isn't always the standard for games. So yeah, I beat the game with 80-odd lives, happily jumping through some really tough levels with 3D on full, so it's clearly not too bad! Well, when I played the Wonderful 101 at PAX, it was still the P-100 build from E3. I guess they don't change the build from the first demo builds, which were released shown off a fair bit ago. Great review @ThomasBW84. Very enjoyable read and I've been eagerly anticipating the release of this game. I want this digitally! By the way, I found some mistakes in the 11th Paragraph. "That does bring us the the New mode, introduced to help those that may struggle with the level of difficulty this game"
Never played the Wii version. I totally disagree with the review on the point of waggle. It is perfectly used to add an awesome level of immersion imo. For this feature to have to be relegated to just another button press is sad. Oh well. Love this game! So torn about whether I need to buy it twice though... Love the 3D feature too by the way! Not nearly enough is said about it! ThomasBW84 You're more than welcome. "It's most certainly on like... well, we're not allowed to say that, but you know what we mean." Please allow me the honors Thomas. Ahem.. IT'S ON LIKE DONKEY KONG! I've already got it on Wii,but I might choose this as my free game. Own the Wii version and I love it. Unfortunately so do my 2 boys so I don't get to play it much. I will definitely be picking htis one up so hopefully I can get around to finishing it since i never seem to get a chance to finish the Wii version. Never played it on Wii, but this is sounding like the definitive version of the game to pick up. Definitely a purchase for me. Won't be buying this. Can't reconcile the poor framerate. Sad, because DKCR is one of my favorite games ever and I'd love to play a portable version that lives up to the Wii game. But how is shaking the controller to perform a roll or blow more immersive? Surely any immersion in the game comes from the atmosphere, the characters and the world that has been created, rather than wacky control gimmicks. Would jumping up in your seat every time you need to jump in Mario instead of just pressing A make you feel more immersed? I doubt it. Pre-ordering this today. A lower framerate? Meh. Doesn't bother me too much. Never bought the Wii version so this has been on preorder for a few weeks now! REALLY? REALLY? If you want to carry around your Wii Console in your pocket,( which would only be possible if you bought those dreadful baggy jeans that you have to keep holding with your hands because other wise they would fall down), go ahead. @accc Sure because THAT MAKES SENSE! Thomas said 'It does the original justice' Wow dude, learn to deal with letdowns in games! No game is perfect! Maybe I'll rent it, I have the Wii one, and I wouldn't play this out of my house. A portable version of Donkey Kong Country Returns! Sign me up! Time to double dip, I remember saying to myself that DKCR needed to be on the 3DS because of the games level design in its dynamic depths. @WhoBeThat I hope that was sarcasm because otherwise, you sound like an a-hole, buddy. It is possible that SOME of us didn't get to play the Wii version. And now with the differences between the Wii version and 3DS, I asked a valid question. I guess that notion was lost among some people. I'd rather play the Wii version on the big screen, in 60fps with waggle. I'll eventually get the 3DS version only because of the stereoscopic 3D effect. Never got around to playing the Wii version so I think I will be picking this one up in the near future. Got this for the Wii, brilliant game, lots of fun and variety. Will get this one for free on the 3DS with their So Many Games! Promotion, can't wait. Just a little while longer for Animal Crossing now! Got the Wii version, but I'm excited about this one too. The volcano world is my favorite because you can tell it use to be a peaceful place with trees and vegetation, but now it's completely destroyed with only a few burned trees left showing what it used to be like. It has great music too that reminds me of Metroid Prime which makes since considering it's made by the same people as Prime. I'm quite glad they put this on the 3DS. 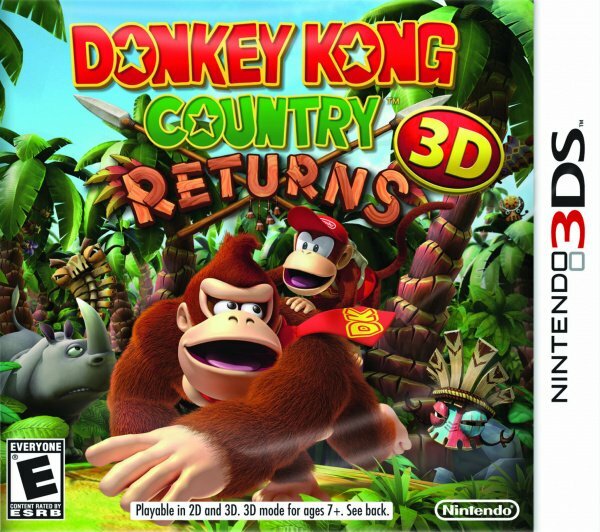 Donkey Kong Country Returns is one of my favorite games of all time, and now all those people who didn't get it on the Wii have a chance to play it on the 3DS! I always felt the Wii version didn't get enough attention too, for such a great game that it was. Considering that I never got the Wii version, I'll definantly pick this up. Gosh, I havent played a main series donkey kong game since DK64. Day 1 for sure!! Cannot wait to get this on Friday, then I'll get animal crossing as my free game in the Nintendo So Many Games! Promotion. After this I'll have to give my wallet a rest! Yeah, that was VERY extreme sarcasm. I suppose your sarcasm meter is broken. Even though I played (and completed) the Wii version, I see myself buying this a few months down the road. The fact that it is so close to the Wii version is very impressive. Never got round to getting this on the Wii, so ordering online tonight based on this review. Better yet - this is my third game from the 'buy three, get one free' promotion - so yay to free animal crossing too!! Awesome game! Just got it:) question: does it remind you of crash bandicoot? Is it just me or are the rocket barrel levels easier in the 3DS version? It seems like the button presses don't make the rocket goes as high, or something. It just seems easier to control. Since I still need to repair my Wii disc drive, & I've played a few minutes of this @ my local Target, & liked it for its platforming, I might get this very soon. Either this, or Dark Moon. Maybe both. My birthday is very soon, so... maybe. For sake of good game collections, I'll try to get this for my Wii, too! I know I am late to the party here, but had the chance to pick this up on ebay from someone wanting to sell their platinum code. Got it for $14.00 and I'm having a blast with it. It feels like the originals, haven't had any problems with frame rate yet, and it looks terrific. Can't play in 3D tho: I tend to use a lot of body English with platformers and get double vision from losing the sweet spot.